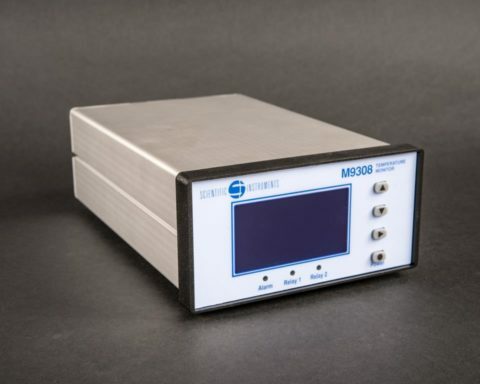 Cryogenic Temperature Multi-Channel Monitor Model 9302/9304/9308 has two, four, or eight input channels with ethernet connectivity, these models are the most flexible and accurate temperature monitors currently available. Virtually any cryogenic temperature sensor from any manufacturer can be selected by a single setting of the front panel. Additional custom or specially calibrated sensors require only a simple setup procedure. 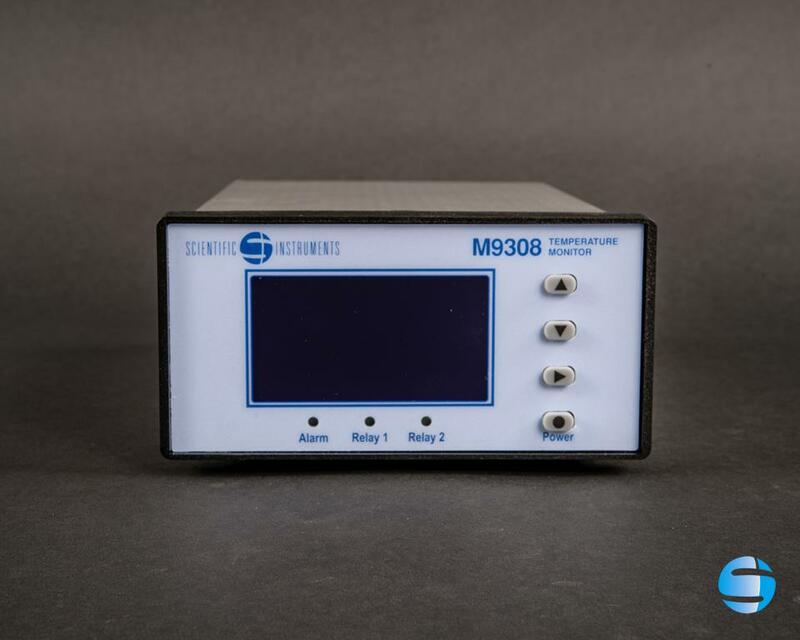 In addition to its high accuracy/performance and low noise design, unique features include: Constant voltage AC sensor excitation internal data logging, ethernet connectivity, large easy to read display and extensive utility software. Scientific Instruments Temperature Monitors are the most compact and flexible cryogenic temperature monitors on the market. 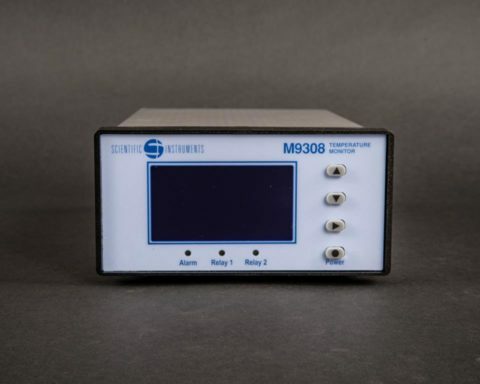 Virtually any cryogenic temperature sensor from any manufacturer can be selected by a single setting on the front panel. Additionally, custom or specially calibrated sensors require only a simple setup procedure. 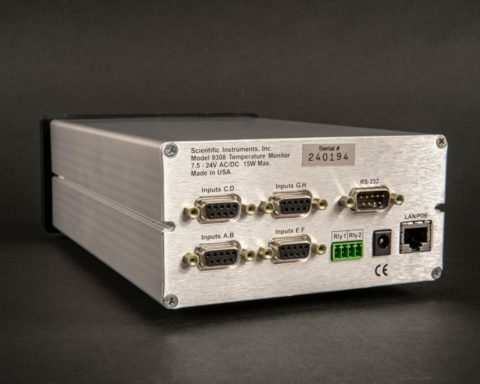 Unique features include: Low cost per channel, Internal Data Logging, Ethernet connectivity, a large easy to read display and extensive applications software. ■ Two, Four or Eight multipurpose input channels support Diode, Platinum RTD and most cryogenic NTC temperature sensors. Dual thermocouple inputs are optional. ■ Operation from 1.0K to over 1500K with an appropriate sensor. Constant-Voltage, AC excitation of resistive sensors minimizes errors and extends their useful temperature range. ■ Continuous data logging into internal, Non-Volatile memory. ■ Two large, dry-contact relay outputs. ■ Flexible input power: Power-Over-Ethernet or 7.5-24V AC/DC. ■ Built-in web server. Temperature monitoring and instrument configuration can be performed using any web browser. 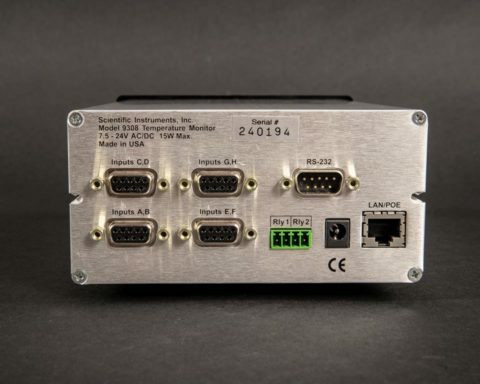 ■ Remote interfaces include 100/10 Ethernet and RS-232. 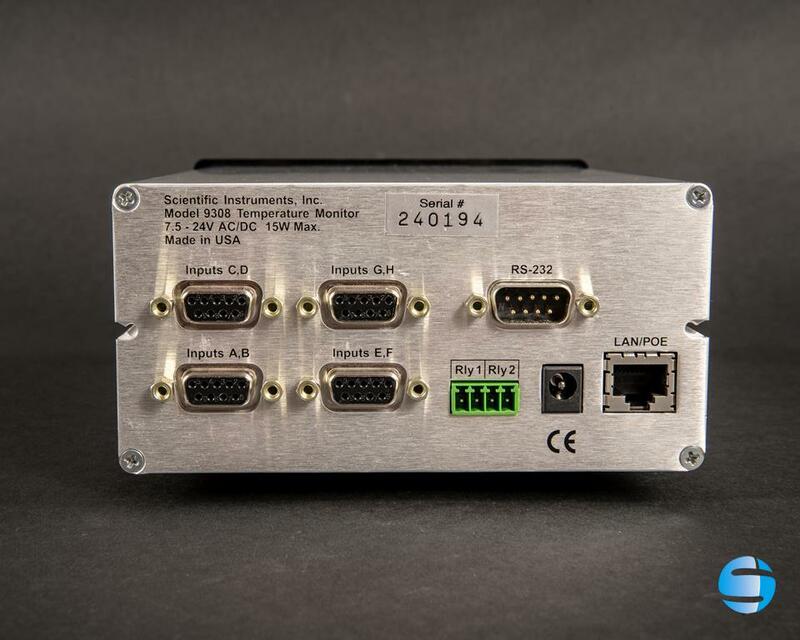 USB 2.0 and IEEE-488.2 (GPIB) are optional. LabVIEW™ drivers available for all interfaces. If you have any additional questions, please contact Scientific Instruments today! The Model 9308 has eight input channels, The 9304 has four and the 9302 has two. All inputs are identical and independent, each capable of supporting a wide range of sensor types. Thermocouple Connection: External option. Field installable. Input Configurations:See input specifications table. Voltage Excitations: 100mV and 10mV. Minimum excitation current is 150nA, maximum is 2.5mA. Sample Rate: 7.5Hz per channel. Isolation: Input channels are not isolated. Time stamped temperature data can be logged into an internal 800 entry circular buffer. Buffer memory is non-volatile and will retain valid data during loss of power. 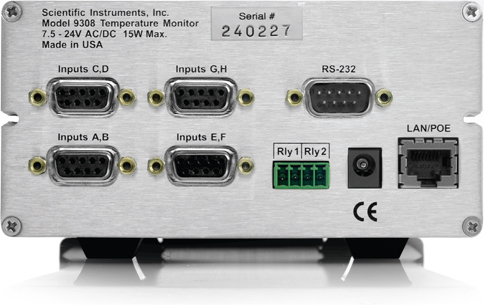 All eight input channel temperatures are recorded. Audible and Visual Alarms: Independent audible, remote and visual alarms. Alarms can be latched. Relays: Two dry-contact relays. N.O. contacts available. Contact ratings: 10A@125VAC or 5A@30VDC. Maximum reading rate for all interfaces is >40 rdg/s. Ethernet: Connects to any 100/10 Ethernet Local Area Network. Electrically isolated. TCP and UDP servers provide remote control by using an ASCII command language. HTTP provides built-in web server. SMTP sends e-mail. IEEE -488.2 (GPIB): External Option, field installable. USB 2.0: External option, field installable. Serial port emulation. Programming Language: IEEE-488.2 SCPI compatible. LabVIEW™ drivers available for all interfaces. Ambient Temperature:25ºC ± 5ºC for specified accuracy. 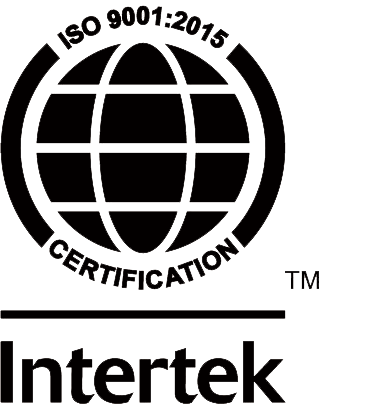 Power Requirement: IEEE-802.3at Power-Over-Ethernet (requires powered hub or injector) or 5 – 24V AC/DC. (External power supply included) 10VA. Four DB-9 recepticals provide 4-wire measurement for two sensors each. The Model 9302 has one connector. The Model 9304 has two and the Model 9308 has four. Any input connector can also be used for the dual thermocouple option connection. Standard RJ-45 Ethernet connector. Power-over-Ethernet connection, GPIB Option. 7.5 to 24 V AC/DC. DB9 plug. Also used for USB option connection.